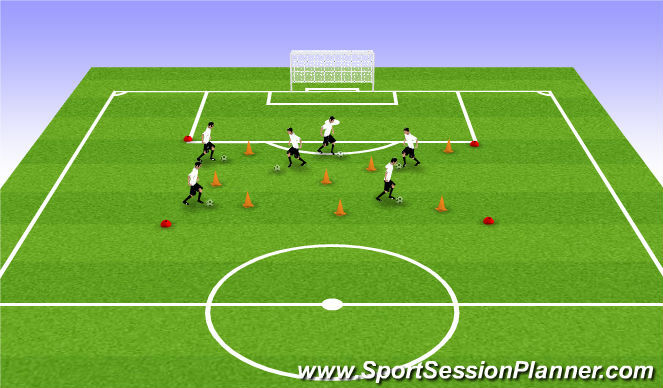 Players dribble in a 15x20 yard area. 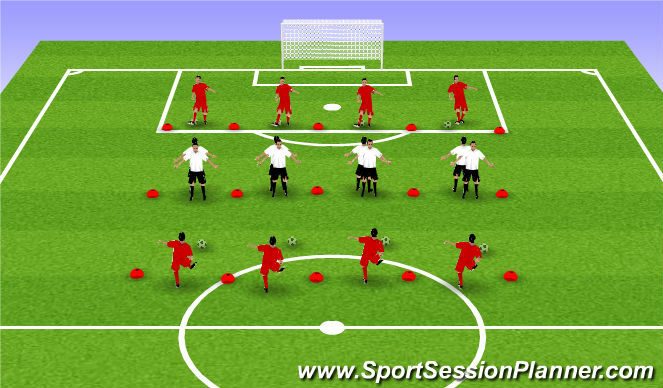 4 players split into a different 10x10 square with a maneqin or cone in centre of each pitch. Players start by dribbling in each area performing different skills and turns to beat mannaequins. Players start in each corner of squared area. This zone is based on players turns. 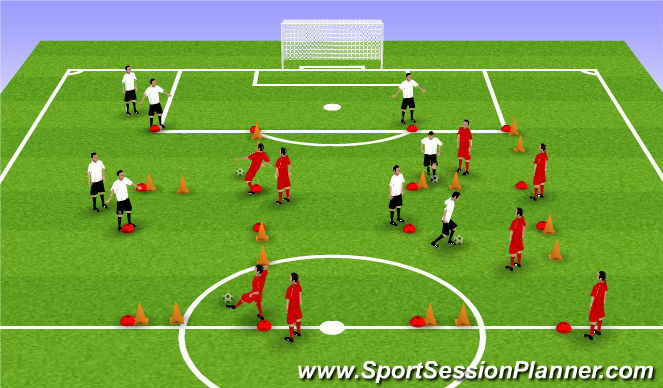 Players dribble up to manneqin and perform turn to retun to cone. Drag backs, Cruyffs etc. Players perform a skill to beat manneqin and continue to opposite cone. Step overs etc can be performed. Players can produce any move from 3 previous zone drills. Slow in - Fast out! Ensure players skills and turns are performed at good pace and ensure players exoplode away once skill is performed. Players have to trick opponents so when performing skills must be a good element of disguise to them. Pairs are now working in channels with an area of 5x10 yards. Red defending players play a pass over to the attacking white player. Red defending player can only close down on white players 1st touch. White attacking players aim is to dribble the ball over opposing line to score. Players switch roles after each attempt and keep score. If defending player wins the ball back he can score by dribbling over opponents line. Designate each pitch premier league to conference level for example. The player who wins after 1-2 mins play gets promoted and losing player relegated. 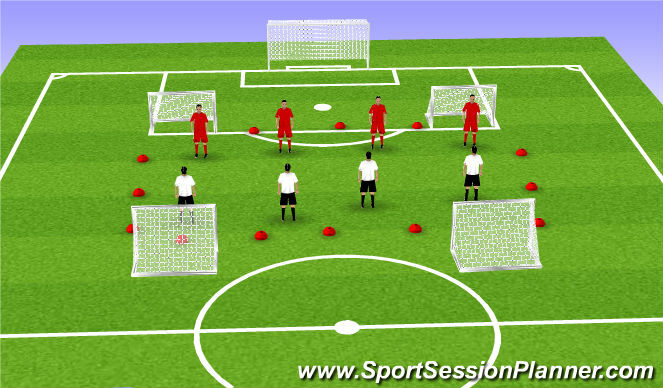 Can set up four or more pitches easily allowing 4 or 6 players per pitch. Defending reds pass the ball over to attcking white players whose aim is to score by dribbling through either one of the orange cones goals which have been set up. Goal only counts if ball is dribbled through. Again defender and attacker switch after each go. Like previous can have a promotion and relegation factor to challenge players. Whites challenge is to simply score passed the 2 red defendng goals an reds the same target against the whites defending goals. Encourage players to dribble at every opportunity possible and do not encourage consistant passing in the game. If 4v4 not getting success can play 5v3 to one side giving them the overload to allow sucess and more dribbling passed an opponent opportunities. Players can score in all 4 goals. Team who scores in a goal retains possession but can not score in that goal straight after. 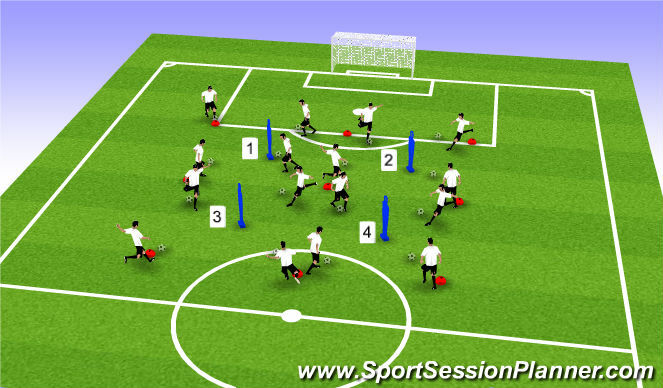 With one group playing 4v4 goal game, second group should be playing line ball. 20x20 yard area with 2 5x20 yard areas. 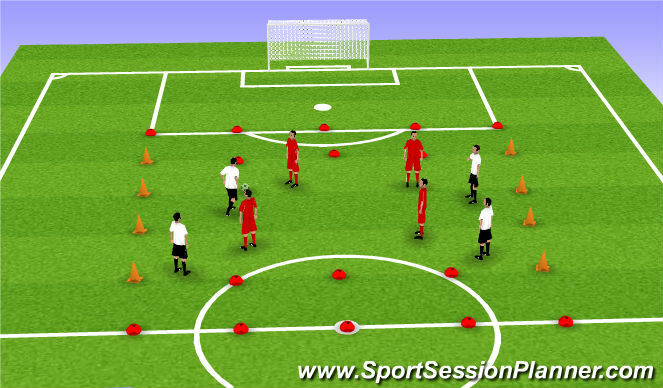 Players aim is to simply dribble the ball into the opponents red coned zone which will count as a goal. Once goal is scored opposite side gain possession to attack again. No passing - Every player must attempt to go it alone and dribble into zone. Can players turn without touching the ball or one just one single touch. Spacial awareness on tight pitch so important. Players encouraged to get into most space possible and should always demanding and wanting the ball from other players. Again being encouraged to play without fear.